Good morning! It has been 21 days of sharing some of my cheongsam collection with one and all. I enjoyed every minute of it, from choosing what to wear to where to be photographed! Now that we are focused on year end activities, I will take a break from the Cheongsam Challenge too……and let’s see what the New Year brings. Thank you to all your kind comments. I am pleased that I have managed to share some joy with you. Now on Day 21 of Suzanne’s Cheongsam Challenge, I am dressed in an electric navy blue cheongsam with teal coloured highlights. The embroidered peacocks in silver thread are filled with aquamarine, teal and sea green sequins. The perfect colours for ushering in the New Year 2018!! My understated accessories allow the glitz of the fabric to shine, and silver sandals complete the ensemble. I might be 93, but am ready to go out for some toe tapping music and dance! I am very grateful for all the blessings showered upon us in every way, and my wish is for God’s love to fill hearts around the world! A very happy and blessed New Year to you and yours. Everything is coming up roses, on Day 19 of Suzanne’s Cheongsam Challenge. Beautifully embroidered roses in delicate hues of pink and wine are highlighted with strategically placed sequins, on the organdie fabric. I chose to go with a pink lining for visual impact! Isn’t it just delightful? I feel as pretty as a princess! Crystals for accessories and my lacey filigree sandals, and I am ready for an evening out yet again. 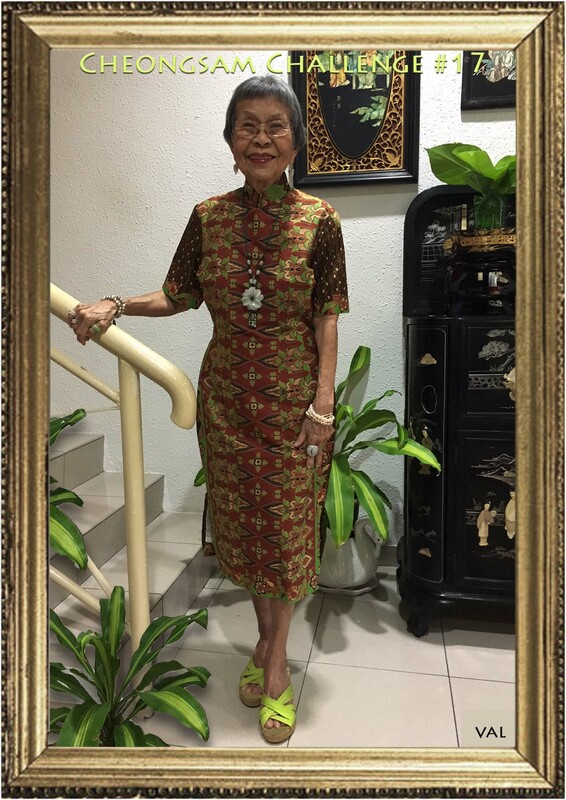 Who says at 93 one cannot go out to party in a lovely cheongsam? A touch of Christmas is reflected in the glass jar of red ornaments on the writing desk. Yes, time is flying by! I am in the mood for gold today – Day 18 of Suzanne’s Cheongsam Challenge. The batik sarong used for this cheongsam is printed with gold patterns as the main background with red flower buds and green design accents, while the edges are anchored in black. I trimmed the side shoulder opening and collar in matt gold satin. To bring the red floral buds to life, I wore my red roses’ set which I assembled myself. And, of course I am photographed beside a gold bejewelled mirror for extra emphasis. I am wearing red beaded sandals which have been worn with other ensembles, but cannot be seen in this photo. 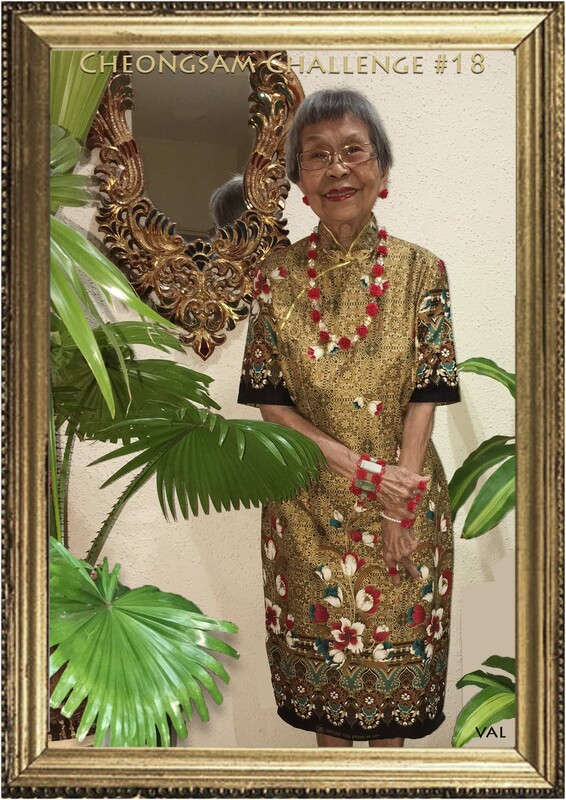 Do the gold hues not lend a certain glow to a 93-year young lady? Have a wonderful day and God bless. Day 17 of Suzanne’s Cheongsam Challenge calls for an interesting batik sarong in brown and black, highlighted with leaf green. Standing outside in the garden against a background of lush greenery, at first, and I just blended in with the vegetation! So I settled for an indoor shot with a trio of green plants instead. Given the rather dense pattern of the fabric’s front panel, there is no front button opening. Hence, simple accessories that complement the colours of the cheongsam were chosen while bright green sandals complete the ensemble. At 93, it is a wonderful start to the day when all is well-coordinated.